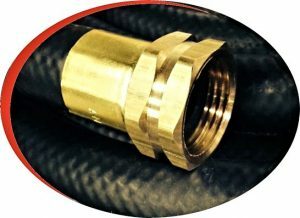 Our General Service EPDM rubber hose is a durable hose model commonly assembled as a water hose (shown), heater hose, or pneumatic supply hose. This hose can also be used for agricultural and light chemical applications. The domestic EPDM rubber tube and cover is resistant to ozone, flexible in cold climates, and can handle fine oil-misted compressed air. Dual textile reinforcement plies add durability and allow for a 200 PSI service rating with 4:1 burst ratio. 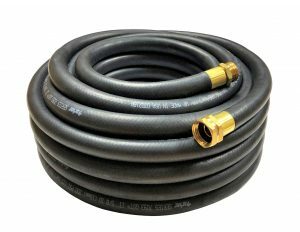 1522 series EPDM hose is a highly versatile and long lasting hose option for industrial, agriculture, and contractor supply service. Superior ozone and abrasion resistance when compared to imported hose or garden hose. Available cut and assembled or in long length reels, from 1/4 inch through 2 inch diameter. A 300 PSI rated version is available by special order (minimum may apply). 1522 series water hose assemblies feature domestic crush proof brass GHT fittings (shown, for water service only). Other configurations are available by request.